A pampering & relaxing, lavender scented aloe vera base premium natural body wash. Lift your mind, body & soul with this natural aroma therapeutic hand and body wash daily to remove dirt, grime and odour, and relieve stress and tiredness in the most luxurious manner, without stripping your skin of its natural oil. aloe barbadensis(aloe vera) leaf juice, coco-glucoside, decyl-glucoside, glycerine, xanthan gum, lavandula angustifolia(lavender) oil,pelargonium graveolens oil, citrus bergamia(bergamot orange) peel oil, origanum vulgare oil, thymus vulgaris (thyme) extract, olea europaea(olive) leaf extract, rosmarinus officinallis (rosemary) leaf extract, lavanfula angustifolia(lavender) flower extract, citric acid. Dispense one or two pumps of this luxurious body wash into your hands, apply and massage all over wet body to work up a soft lather, rinse thoroughly with tepid water and towel dry, followed by body lotion to keep your skin moisturised, hydrated and smelling divine. This body wash is suitable to be used frequently as a luxurious & pampering hand wash as well. 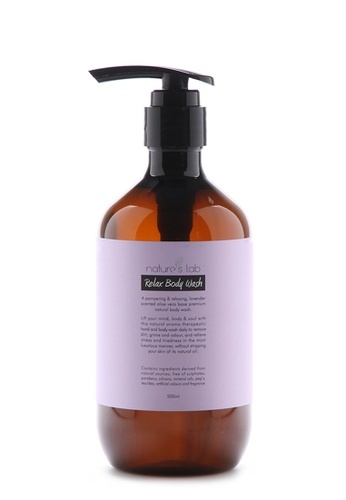 Can't find Nature's Lab Relax Body Wash in your size?